Guildford Borough Council is taking an in-depth look at the way it operates its leadership, its Executive and other decision-making operations. A cross-party group of councillors has started work on a “balanced and thorough look at how these operations work”. 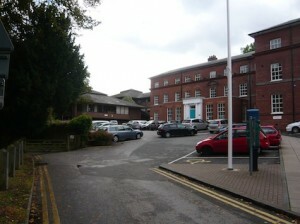 Guildford Borough Council Offices at Millmead. At a meeting on October 7 the council tasked its joint scrutiny committee to review all available decision-making models and to recommend any improvements to the council’s governance arrangements. Following a meeting of the joint scrutiny committee on November 13, the council reports that a separate task and finish group (TFG) was established to do this “important and detailed work”. In a statement from the council, the chairman of the TFG, Cllr Tony Rooth, explained: “We are taking a fresh and open look at the way the council operates and makes decisions. “The task and finish group is cross-party, non-political and starts with a blank canvas. We are keen to start from first principles to look at what good governance means. This is a very important part of the council’s responsibility and we want to hear views about our current structure, and look at all the possible options, before recommending any changes. The TFG will gather data and feedback from a variety of sources to identify the essential attributes that best meet the council’s needs. They will then evaluate the different models and make a recommendation to the joint scrutiny committee, Executive and council. Since the Localism Act 2011, there are three main governance models to choose. Mayoral system – these councils have a directly-elected executive mayor with wide decision-making powers. The mayor appoints a cabinet made up of other councillors, who may also have decision-making powers. These councils must also have at least one overview and scrutiny committee. Committee system – these councils make most decisions in committees, which are made up of a mix of councillors from all political parties. They have a number of service committees, which will often align with council departments. Normally this model has a policy and resources committee that makes the key policy decisions. This is usually chaired by the leader of the largest party. They may have one or more overview and scrutiny committees to coordinate and scrutinise work programmes, but are not required to. Correspondence published on The Guildford Dragon NEWS, in reply to a range of stories relating to Guildford Borough Council, have, at times, questioned the current system in operation at the council. Readers of the Dragon are always welcome to have their say. What are your thoughts? Please leave a reply in the box.